Sign up for Broadjam today to follow Paul Evans, and be notified when they upload new stuff or update their news! Paul is a mature songwriter, and has been compared to great songwriters like Bob Dylan, Neil Young and Tom Waits. 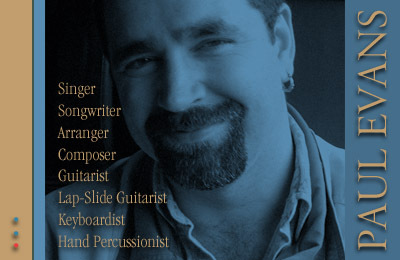 He writes everything from country, pop, blues, R&B, jazz, folk, dance, world, instrumental and even childrens music. He claims not to have musical boundaries and plays several instruments and musical styles (guitar, slide guitar, bass, hand percussion, keyboard, singing, and also has recording experience). In addition he has had plenty of life experience to draw on for meaningful and powerful songs. Having over 100 songs that he’s written in the past four years shows his writing verocity. He is inspired by artists as diverse as Prince, James Taylor, Crosby Stills Nash & Young, Neil Young, Bob Dylan, Muddy Waters, Eric Clapton, JJ Cale, Johnny Cash, Tom Waits, Ry Cooder, Stevie Wonder, Ray Charles, Norah Jones and Amos Lee.